Members of labor groups marched in Ayala Ave. today in a preview of the big workers rally for Labor Day and to slam Philippine Airlines (PAL) for labor violations in the agencies it has contracted. Workers from the Philippine Airlines Employees Association (PALEA) and Partido Manggagawa (PM) marched this afternoon from the Makati fire station to the PNB headquarters which also houses PAL offices. “The inspections conducted by the Department of Labor and Employment (DOLE) with the participation of PALEA members have uncovered breaches of general labor and occupational safety standards. Also exposed by the inspection is the fact that agency workers are doing the work of formerly regular workers. 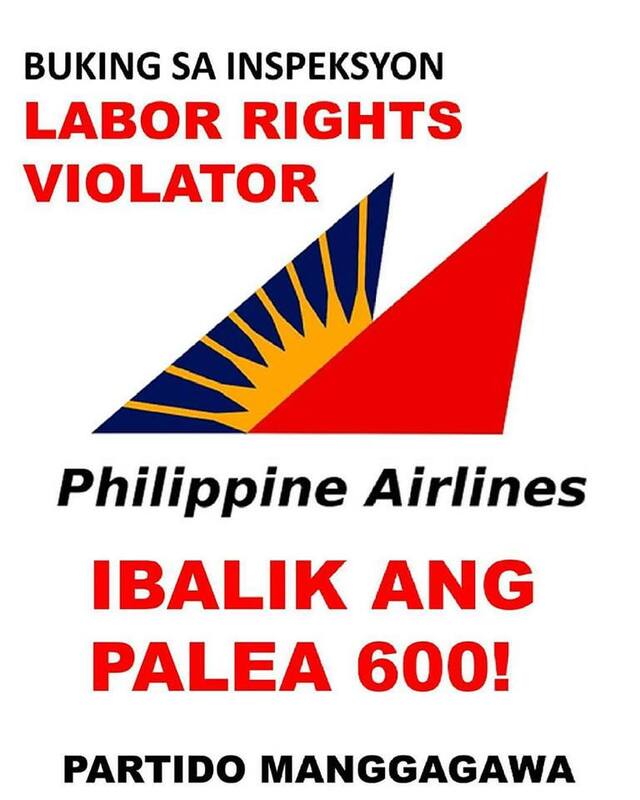 That means PAL is guilty of breaking the law and rules on contractualization,” explained Gerry Rivera, PALEA president and PM vice-chair. Last week, DOLE announced in a press conference that inspections conducted through the Special Assessment or Visit of Establishments (SAVE) found PAL and telecom company PLDT guilty of violating labor and safety rules, including on subcontracting. DOLE Secretary Silvestre Bello even proclaimed that he will order the regularization of some 10,000 PLDT agency workers as a consequence. “The protest march today at the country’s central business district on the eve of ASEAN is also a condemnation of the anti-labor and pro-business agenda of the meetings. Labor rights are being sacrificed at the altar of trade liberalization through ASEAN and other multilateral institutions like the WTO and APEC,” insisted Rene Magtubo, PM chair. SAVE inspections conducted by DOLE and PALEA at PAL and PAL Express are still ongoing as only operations in provinvial airports have been assessed and offices in Metro Manila are yet to be visited. Rivera also blasted PAL for sabotaging the inspections by questioning PALEA’s participation and delaying the conduct of SAVE in its Metro Manila operations. PALEA and PM are participating in the nationwide Labor Day rallies led by the coalition Nagkaisa. On May 1, Nagkaisa members will assemble at Welcome Rotonda at 7:30 am and then march to Mendiola for a program to call for a scrapping of the newly released DO 174, an end to all forms of contractualization and the protection of labor and human rights. Also PM-Kabataan, the youth wing of PM, is also a holding a mass action at Welcome Rotonda at 4:00 pm on April 30 to highlight the pressing concerns of young workers like unemployment, contractualization and decent wages and benefits.